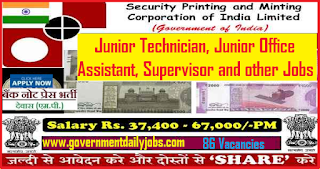 NOTIFICATION: Bank Note Press, Dewas (BNP) [Security Printing and Minting Corporation of India Limited” (SPMCIL),] inviting online applications for filling up 86 vacant posts of Junior Technician, Junior Office Assistant, Supervisor and others from eligible and interested willing candidates. It is latest & good information for unemployed personnel those who are looking for these new Jobs in Government sector & other organizations. Job seekers, who wish to apply for these vacancies regarding BNP Recruitment 2018, must have passed of ITI/Diploma/Graduation with typing knowledge. Applicant’s upper age should be as per Govt. rules and age relaxation is applicable to all reserved category candidates i.e.SC/ST/OBC/PWH/Ex Servicemen/Women candidates etc. NO OF POSTS: 86 vacant posts of Junior Technician, Junior Office Assistant, Supervisor and others in Bank Note Press, Dewas (BNP). 1. Junior Technician (Ink Factory) - 30 posts. 2. Junior Technician (Printing & Platemaking) - 9 posts. 3. Junior Office Assistant - 18 posts. 4. Supervisor (Printing and Platemaking) - 15 posts. 5. Supervisor (Electrical) - 01 post. 6. Supervisor (Information Technology) - 01 post. 7. Supervisor (Air Conditioning) – 02 posts. 8. Supervisor (Technical Support-Civil) - 03 posts. 9. Supervisor (Ink Factory) - 05 posts. 10. Safety Officer - 01 post. 11. Welfare Officer - 01 post. 1. Junior Technician (Ink Factory): A passed of ITI/ Diploma in dyestuff technology/ paint technology/ surface coating technology/ printing ink technology/ printing technology or equivalent from any recognized Institute for BNP Recruitment 2018. 2. Junior Technician (Printing & Platemaking): A passed of ITI certificate in Printing & Plate making Trade viz. Litho Offset Machine Minder, Letter Press Machine Minder, Offset Printing, Platemaking, Electroplating, Hand Composing. Diploma in printing technology from AICTE approved Institute or equivalent from any recognized Institute for BNP Recruitment 2018. 3. Junior Office Assistant: A passed of Graduate with at least 55% marks and computer knowledge with typing speed in English @ 40 wpm / Hindi @ 30 wpm. Proficiency in Office Assistance or equivalent from any recognized Institute. 4. Safety Officer: A passed of Degree in Engineering or Technology and has practical experience of working in a Factory in a supervisory capacity for a period of not less than 2 years; or a recognized degree or diploma in any branch or equivalent from any recognized Institute for BNP Recruitment 2018. 5. Welfare Officer: A passed of Degree or Diploma in Social Science or equivalent from any recognized Institute for BNP Recruitment 2018. 6. Supervisor (Printing and Platemaking): A passed of Diploma in Printing Technology from AICTE approved Institute. B.Tech./B.E. in Printing Technology or equivalent from any recognized Institute for BNP Recruitment 2018. 7. Supervisor (Electrical): A passed of Diploma in Electrical/Electronic from AICTE approved Institute. B.Tech./B.E. in Electrical/Electronics Engineering or equivalent from any recognized Institute for BNP Recruitment 2018. 8. Supervisor (Information Technology): A passed of Diploma in IT/Computer Engineering from AICTE approved Institute. B.Tech./B.E. in IT / Computer Engineering or equivalent from any recognized Institute for BNP Recruitment 2018. 9. Supervisor (Air Conditioning): A passed of Diploma in Air-Conditioning/Refrigeration Engineering from AICTE approved Institute. B.Tech./B.E. in Air-Conditioning/Refrigeration Engineering or equivalent from any recognized Institute for BNP Recruitment 2018. 10. Supervisor (Technical Support-Civil): A passed of Diploma in Civil Engineering from AICTE approved Institute. B.Tech./B.E. in Civil Engineering or equivalent from any recognized Institute for BNP Recruitment 2018. 11. Supervisor (Ink Factory): A passed of Diploma in dyestuff technology/ paint technology/ surface coating technology/ printing ink technology/ printing technology from AICTE approved Institute. B.Tech. in Dyestuff Technology/ Paint Technology/ Surface Coating Technology/ Printing Ink Technology/ Printing Technology or equivalent from any recognized Institute for BNP Recruitment 2018. 1. Junior Technician: 25 years. 2. Junior Office Assistant: 28 years. 4. Safety Officer: 30 years. 5. Welfare Officer: 30 years. 1. 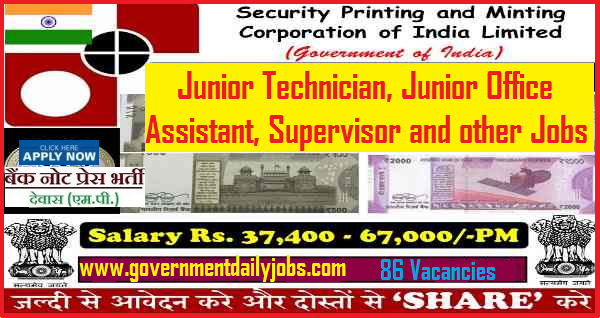 Junior Technician (Ink Factory): Rs.7750-19040/- (Pre-revised). 2. Junior Technician (Printing & Platemaking): Rs.7750-19040/- (Pre-revised). 3. Junior Office Assistant: Rs.8350-20470/- (Pre-revised). 4. Supervisor (Printing and Platemaking): Rs.26,000-1,00,000/-. 6. Supervisor (Information Technology): Rs.26,000-1,00,000/-. 7. Supervisor (Air Conditioning): Rs.26,000-1,00,000/-. 8. Supervisor (Technical Support-Civil): Rs.26,000-1,00,000/-. 9. Supervisor (Ink Factory): Rs.26,000-1,00,000/-. REQUIRED APPLICATION FEE: For said vacancy a non- refundable application fee is to be paid by the candidates as per rules. An amount of Rs. 400/- + GST by General and OBC category candidates to be paid through online mode. Candidates belonging to SC/ST/PWD/Ex-Servicemen are exempted from payment of application fee. SELECTION PROCESS: Applicants who are screened for applicability/ eligibility are being selected as per organization policy/rules depending on the basis of their performance in Online Examination (objective type) and Typing Test. Last date for printing your application: 24-11-2018. Tentative date of online examination at selected centres: November/December 2018. Tentative date of Typing Test which will be conducted "Online" at selected centres: November /December 2018. HOW TO APPLY: For said posts (SPMCIL BNP Dewas Notificationof Assistant, Junior Technician & Supervisor 86 Vacancies) eligible, willing and interested candidates may apply through online mode at official website up to last date. Applicants must retain a hard copy for future refence. CONTACT ADDRESS: Bank Note Press Dewas (BNP), 455001 (M.P.). CONCLUSION: Bank Note Press, Dewas (BNP) invites online application for the recruitment of 86 vacant posts of Junior Technician, Junior Office Assistant, Supervisor and others on contract basis from Indian residents who are eligible & interested; candidates can apply through online application. LAST DATE TO APPLY: 09-11-2018 for Bank Note Press Dewas Recruitment 2018 Apply for 86 Assistant & Supervisor Vacancy.